Khasab is located right in the heart of the famous Musandam peninsula, which is one of the top tourist destinations in all of the Middle East. Khasab is the central location for most tourism companies in the region and most routes begin from there and take you anywhere you want to go with carefully designed tour deals covering most tourist locations both on land and ones that require boat travel. Khasab Sea Tours has been serving the tourism industry for a very long time now and we have boosted the travel experience for a lot of people manifolds providing them most affordable and enjoyable Musandam tour deals. Our Musandam Khasab Deals including Half Day and Full Day Dhow Cruise Tours, Mountain Safari, Fishing Opportunity, Overnight Camping on the calm and peaceful beaches, Overnight Sleeping and Dinner on the Dhow Cruise and City tour as well. We make your time worth it and give your calm memories that stay forever. Khasab Sea Tours guarantee best price Musandam Khasab deals for dhow cruise trips for visitors in Khasab Oman. Enjoy Khasab dhow cruise with playfully ducking diving dolphins & snorkeling in dynamic water. Cruise in crystal clear water; of witnessing to some great scenery of water surrounded by breath-taking beauty of mighty mountains. The inlet is calm and sheltered. There is strong possibility to see Schools of Dolphins swimming alongside the dhows. Boat anchors at the famous Telegraph Island where you can swim and snorkel as well to the Seebi Island with whole day cruise. Thrill to swimming & snorkeling in a rich colorful underwater world; to watching dolphins in their natural habitats make your Musandam Khasab trip a memorable one. Birthday parties or get-together are also made more memorable on the boat. We have best price Musandam tour deals on our dhow cruise packages. The half day dhow cruise include day trip to some of the most breathtaking natural landscapes in the peninsula. You also opt to do a bit of swimming and snorkeling when the boats are docked near beautiful Telegraph Islands. If you want short trip, the half day dhow cruise packages will suit you best and include dolphin watch as well. Timing: 9:30 am - 1:00 pm & 1:30 pm to 5:00 pm. Refreshments: fruits, soft drinks, mineral drinking water. Carpets and cushions on boat. Omani qawa & black tea. Activities: tour include activities such as: Swimming & Snorkeling in crystal clear water (colorful fish, sea coral and reefs) - Visit to telegraph island - sightseeing's of fisher man villages Nadifi, Qanah, Maklab, Sham and fjords of Musandam - fish carving. 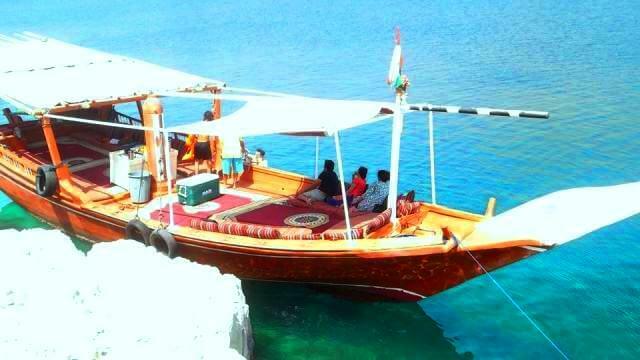 Our Musandam tour deals also include Full day dhow cruise tour. This tour get you many more adventurous activities including breathtaking beautiful landscapes and swimming opportunities at some of the most beautiful sites in the peninsula including the Telegraph and Seebi Island. Lunch served on-board and you can also enjoy Dolphin watching in the warm crystal clear waters. Full Day Starting Timing: 9:30 am - 4:00 pm. Activities: Swimming & Snorkeling (colorful fish, sea coral and reefs) in shallow water - Visit to telegraph island & Seebi island - sightseeing's of fisher man villages Nadifi, Qanah, Maklab, Sham and seebi village - Fjords of Oman Musandam - fish carving. 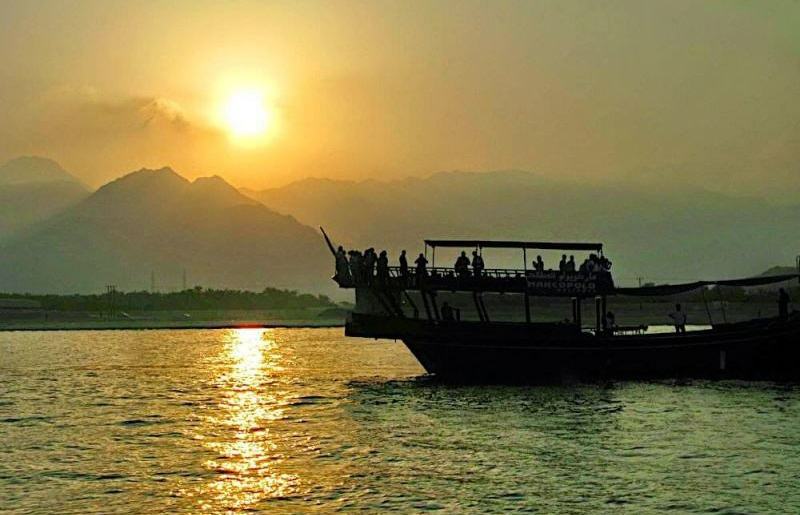 Overnight on dhow cruise is among the most popular Musandam tour deals. The Dhow Cruise ships additional to being some of the most luxurious with all the great decorations on them as well, are also very maneuverable at the same time, allowing them to sail to many great destinations perfect for camping and sightseeing of the highest quality. Fisherman Islands like the Seebi Island, Qanah or many others and some of the calmest ones like the Telegraph Island or even the high mountain cliffs of Musandam fjords present great natural landscapes and sites admired by tourists from all over the world. 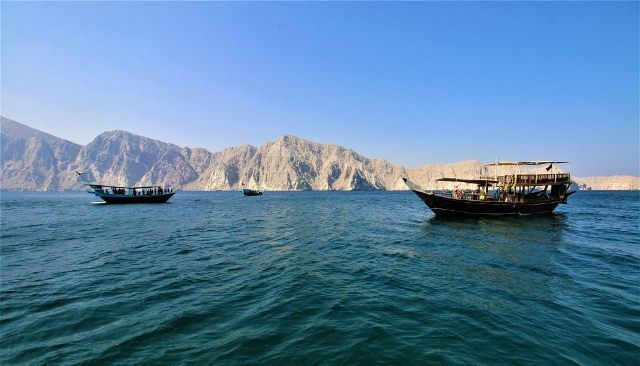 You can also book Private dhow cruise deals options and customize your Musandam peninsula tour just the way you want.